The Biotech industry is not limited to some “crazy scientist locked up in a room or lab,” says Martha Escutia, vice president of government relations at the University of Southern California. There is a wide range of career options and job opportunities in the field, and USC wants to inspire Latino parents and students to begin exploring them, says Escutia, a native of East Los Angeles and former state senator. 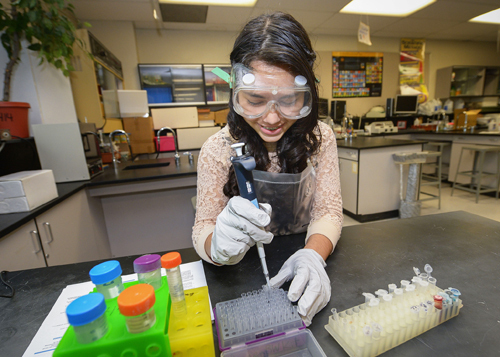 On Saturday, in partnership with the Los Angeles Community Colleges, USC is hosting “Preparing for the Biotech Decade.” a bilingual summit aimed at demystifying STEM (Science, Technology, Engineering and Math) and the Biotech/Bio-Med fields. These fields offer good paying jobs in a lot of different areas, from lab technicians to marketing and communications, logistics and administrative positions, points out Escutia, noting that the USC Health Science Campus in Lincoln Heights is helping to fuel development of a strong bio-med corridor in L.A. County. It’s important that Latino students and their parents in the city and county’s Eastside begin to think about these careers so they can start planning early, Escutia told EGP, adding that there will also be information available to adults looking to make a career change. Saturday’s summit will be held at East LA College from 8:30 a.m. to 12 noon and will include panel discussions and workshops with a variety of experts in the fields. There will also be a resource fair where people can get information on job openings, college requirements and programs, high school classes as well as re-training opportunities for adults. All of the events are free and open to the public and will be available in both English and Spanish. If you ever dreamed of meeting a real life astronaut, this is your chance. Former astronaut, Lieutenant Colonel, USMC Ret. Carlos I. Noriega is one of two special guest speakers Saturday, the other is Dr. Dian Ramos, LA County’s Medical Director for Reproductive Medicine. Noriega will discuss the road that led him to eventually logging more than 481 hours in space, including over 19 EVA hours in three spacewalks. Ivan Alberto Trujillo-Priego is a PhD candidate attending USC and will be one of the panelists speaking Saturday. He told EGP he hopes his story inspires and motivates students to follow in his path. “I don’t know why, but there is something that stops us as Latinos from getting into the science field, maybe because of the lack of resources or due to the lower incomes,” he said. “Biotechnology or science, for that matter, is not for an elite group, and not something alien. We do have the potential and the same capabilities that everyone else has to do it,” he said, referring to the lower number of Latinos in the field. While he was born and raised in Mexico, in some ways Trujillo-Priego has benefited from the same opportunities available to his higher income non-Latino counterparts in the U.S. He comes from a family of engineers and attended private schools, and his interest in the sciences was encouraged from an early age. Math was intuitive to him, he says, but adds he still had to work hard to qualify for the internship program at USC, which presented its own challenges due to his limited ability with the English language. “People from Mexico are sometimes afraid to come to the US to study because we think we won’t be good enough. However, once I came here I realized that I was very well prepared and sometimes at a higher level than the other students born here,” he said. Trujillo-Priego told EGP he wants to disprove the myths that Latinos are not cut out to be scientists. As an international student, who struggled with language barriers, he hopes to further his research on infant development, helping those suffering from motor disorders. Even if students don’t have access to laboratories at home, as he did growing up, Trujillo-Priego says students have other resources available and he suggested they download apps – that are often free – on their smart phones, or check out videos online to strengthen their skills. He also encourages high school students or undecided undergrads to become research volunteers at collage laboratories like those at USC. Lastly, he urges families to attend the free community events in their neighborhoods to learn not only about opportunities in science but in other fields as well. “[Parents], try to give information to your children, push them but don’t do it too much so they don’t feel obligated. Encourage them because sometimes you just need a little push to know what is possible,” Trujillo-Priego said. It’s a view echoed in part by Escutia, who said parents’ shouldn’t be afraid that something may be too hard for their child. “We need to raise expectations,”” she said. “We can’t be afraid to encourage them to take the tougher path, to work hard, to take more challenging classes,” she told EGP, adding that parents’ need to understand that the work they put in today will pay off in the future.